For example, a white, 1-carat round diamond that is VS (very-slightly included) in clarity, F-H (near-colorless to colorless) in color, VG-ideal cut, with no-to-low florescence was selling for approximately $4,850 in March 2017 but is now $4,350 in March 2018, a 10% decline. However, over the same period of time the price of an equivalent natural diamond went from $5,850 to $6,150, representing about a 5% increase. 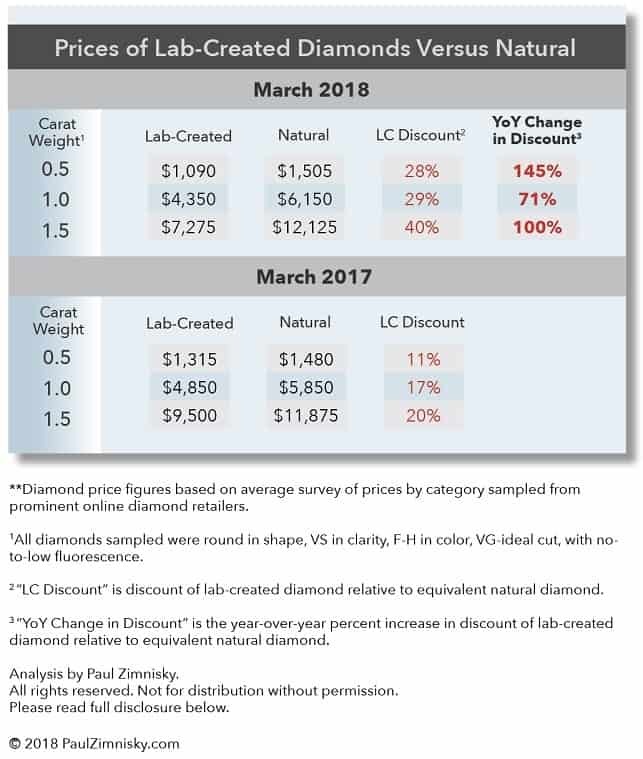 Thus, the discount of the lab-created diamond relative to the natural equivalent was approximately a 17% in March 2017, but is now about 29%, a 71% year-over-year increase. Lab-created diamonds are becoming less expensive relative to natural equivalents as investment in lab-diamond production technology has rapidly improved production economics in just the last few years. This has led to rapid relative supply growth and an environment that is more price competitive for lab-diamond manufacturers. However, actually gauging lab-diamond supply growth is difficult. The global proliferation of lab-diamond production facilities in recent years, from China to Russia to the U.S., has made tracking production figures challenging, especially given that the companies involved are private and proprietary in nature. 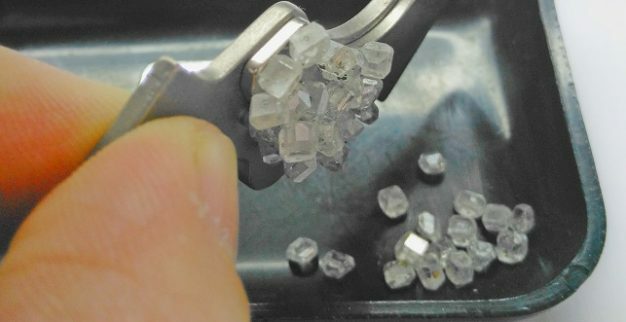 Further complicating the process is the range in quality and scale at which lab-diamonds are being produced. Natural diamond production quality can be segmented as approximately 40% gem-quality, 20% near-gem-quality, and 40% industrial-grade. Gem-diamonds are used in jewelry, industrial-grade diamonds are used for abrasive and other industrial application, and near-gem diamonds are used for both jewelry and more-specialized industrial application, with the split of use dependent on market prices and demand. It is important to note that natural industrial-grade diamonds are simply seen as a by-product, as the presence of gem-quality diamonds in a deposit are what drive the economics behind natural diamond production decisions. In the case of lab-diamonds, the ability to create higher-quality gem-diamond product economically is a relatively recent development –within the last decade. Even with the recent developments in technology, current lab-created production of true gem-diamonds only represents <10% of global output, estimated at <5M carats, which compares to natural gem-quality output of ~60M carats (based on 40% of an estimated total natural production of 147M carats in 2018). The business of manufacturing lab-created diamonds for industrial application (typically referred to as synthetic diamond) has been around for decades, and the industry currently supplies >99% of global industrial diamond supply for use as abrasives (production is in the billions-of-carats for context). Lab-production of near-gem-quality diamonds is where supply analysis gets especially challenging. Producers of synthetic industrial-quality diamonds have been advancing their production capability through improved technology which has enabled them to increase the quality of their product from industrial to near-gem quality. Given that billions-of-carats of industrial-quality diamonds are produced each year, it becomes apparent that lab-created near-gem production could be in the hundreds-of-millions of carats; and some of this product is being passed off for use in jewelry –which is primarily used to embellish larger-stones and for use in pavé settings. The natural diamond industry has been proactively developing affordable screening technology so that lab-created diamonds of all quality and sizes used in jewelry can be properly disclosed and sold as such. 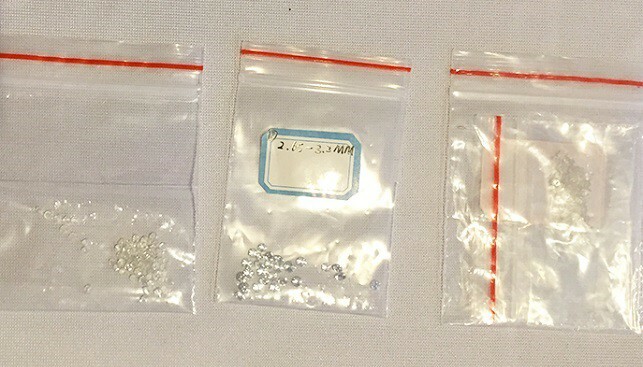 As lab-diamond production continues to accelerate, it seems inevitable that the price spread between lab-created and natural diamonds across all sizes and qualities will continue to widen, especially in the case of generic lab-diamonds, those that are not supported by a manufacturer or retailer’s brand. 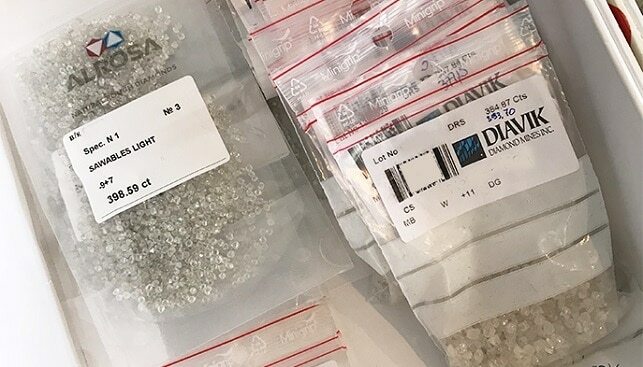 The high-tech industry enthusiastically awaits economically available mass-produced high-quality diamond, the lab-diamond manufacturers know this and most are just using jewelry as a stepping stone.